WEST LAFAYETTE, Ind. (AP) — Ryan Cline has turned into a key performer for Purdue. Cline made five 3-pointers on his way to 17 points, and the 24th-ranked Boilermakers routed Robert Morris 84-46 on Friday. Cline was 6 for 10 from the field in his sixth straight start to begin the year. The senior guard is averaging 14.3 points after making just seven starts over his first three seasons in the program. 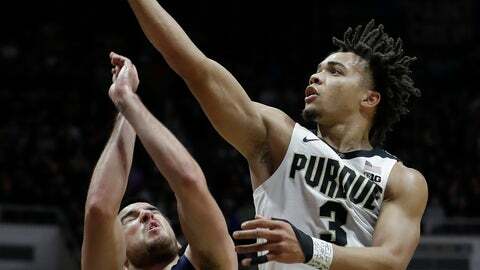 Carsen Edwards led Purdue with 19 points, helping the Boilermakers (5-1) bounce back from their first loss of the season Sunday night against No. 13 Virginia Tech. Edwards was 5 for 17 from the field against the Colonials, but also contributed five assists, four steals and a blocked shot. Purdue used an 11-0 run to open a 59-28 lead with 10:47 left in the second half. The Boilermakers led by as many as 43 points. The bigger Boilermakers enjoyed a 43-27 rebounding advantage and made 20 of 23 foul shots, compared to 8 for 10 at the line for the Colonials. Malik Petteway led Robert Morris with 10 points. The Colonials (3-3) shot 31.5 percent (17 for 54) from the field. Cline went 5 for 7 from 3-point range. “We wanted to see how we bounced back from that loss, which a team has to do to push forward,” Cline said. Robert Morris had won three in a row since a 74-60 loss at Missouri State on Nov. 9. Next up for Purdue is a pair of tough road games. The Boilermakers visit No. 14 Florida State on Wednesday night and then take on No. 9 Michigan in the Big Ten opener next Saturday. Purdue got 37 points from its reserves. Robert Morris’ starters finished with 27. Evan Boudreaux, a graduate transfer from Dartmouth, and freshman Trevion Williams had nine points apiece. Eric Hunter Jr. and Sasha Stefanovic each scored eight for the Boilermakers. Robert Morris: Hosts Youngstown State on Wednesday night. Purdue: Takes on the Seminoles in the ACC-Big Ten Challenge.